When I moved out on my own and into my first apartment in my early 20's, I wasn't much of a cook. I relied heavily on pre-packaged foods and I ate out a lot. I remember calling my grandma one day to ask her how she made egg salad. Yup, I really had no clue. Maybe I knew that the eggs went in boiling water, but I certainly didn't know for how long, or what to do after that! Then there was my very first cookbook that my sister got me called "Help! My Apartment Has a Kitchen". This is a great starter cookbook and was just what I needed at the time. My how far I've come! I recently went through my cookbook collection and came across the poor thing hidden in the back behind all of my newer, vegan cookbooks with their long and fancy recipes. There's a time for those types of recipes, and then there's a time for simple ones. That is just what this cookbook offers, simple recipes that are easy to follow. I remembered a really good recipe I used to make from it for Chinese Fried Rice and thought I'd pull the book out of its dark corner and adapt that recipe today! *You want to use leftover cooked brown rice in this recipe. If you use brown rice that was just made, the recipe will come out stickier and not taste as good. *I used homemade soy sauce (recipe to follow). Chop onions and carrots either by hand or in food processor. Place large frying pan over medium heat. Add 1 tsp water. Saute onions and carrots in water for about 5 minutes, or until the veggies are soft and the onions are translucent. Add rice, peas, soy sauce and pepper. Stir continuously for about 5 minutes, or until the rice is hot. If you'd like to make this recipe with eggs, simply scramble one egg first, shred it up and set it aside. Add scrambled egg at the very end and distribute throughout mixture. In a saucepan, over medium heat, stir together all ingredients. Boil gently until liquid is slightly reduced. I'm not a huge soy sauce fan and don't normally use it, but it's really what gives the rice its flavor for this recipe. I wanted to make my own because I don't like the additives in most bottled versions. The fried rice recipe is very easy to make and the possibilities are limitless. You can pretty much add whatever you want to the rice, as long as you stick with the basics. Oh yum, this looks so nice! 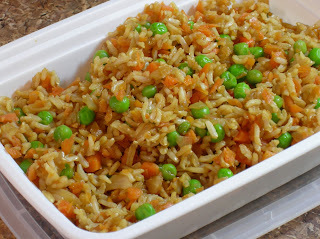 I have some left over rice I think I'll try this for lunch tomorrow! It's perfect with leftover rice! I know, I found the recipe for soy sauce a while back and was really excited myself! The blog I got it from is from another woman who can't eat MSG.